This month, ISC has an Inspiration Challenge for you! Betsy chose this wonderful picture for the inspiration piece. Don’t you just love the colors and images? Want to win a free sheet of ISC images? To be eligible to win, use the picture as your inspiration and create a card or other project using ISC images only, and link your creation to the ISC Blog by May 9th. And this is my version. I really picked up on the orange colors, the flower and butterflies. 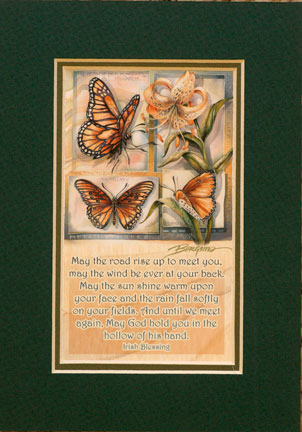 Although it may look like there are layers or cut outs, there’s really only one layer attached to the card, three punched butterflies and one die cut sentiment. 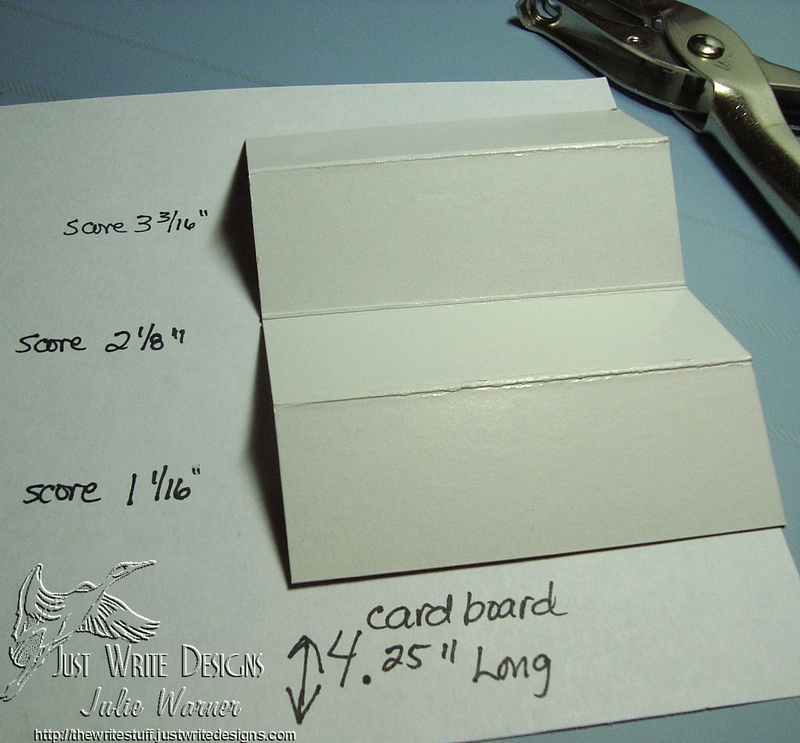 I started with a piece of white c/s slightly smaller than my 4.25 x 5.5 (A2) white card. I stamped the medium and small Bush Flowers with black ink, masking when needed. I added just a touch of color by lightly swiping sponges w/ yellow, orange and pink inks haphazardly across the flowers. I colored over all of the petals w/ a VersaMark pen and clear embossed them. A few specks of embossing powder were spread out around the flowers, but I like the splatter look so I left them and even added a few more. Yellow, orange, pink, ginger and cranberry inks were then sponged over the entire piece and I used more of the darker colors around the flowers to add more contrast. The excess ink was wiped off of the clear embossed flowers. The script from Odd Findings was stamped over the top with ginger ink. 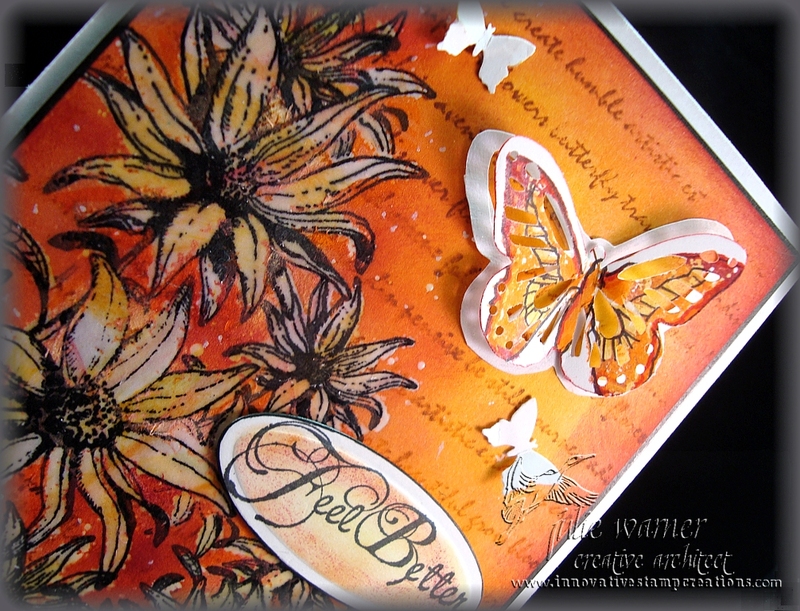 I stamped a butterfly from Friends are Special using the yellow, orange and cranberry inks on a scrap of white then I used a butterfly punch. The punch didn’t exactly line up w/ the image, but I like it anyway. I traced around it on a piece of white and cut the inside out, leaving just a white frame of the butterfly. I used this as my base to attach to the card and popped the butterfly up on top. I added two more small punched white butterflies and the sentiment (also from Bush Flowers). I edged the entire piece w/ a black marker and added a piece of cardboard underneath for a little dimension before attaching it to my card. 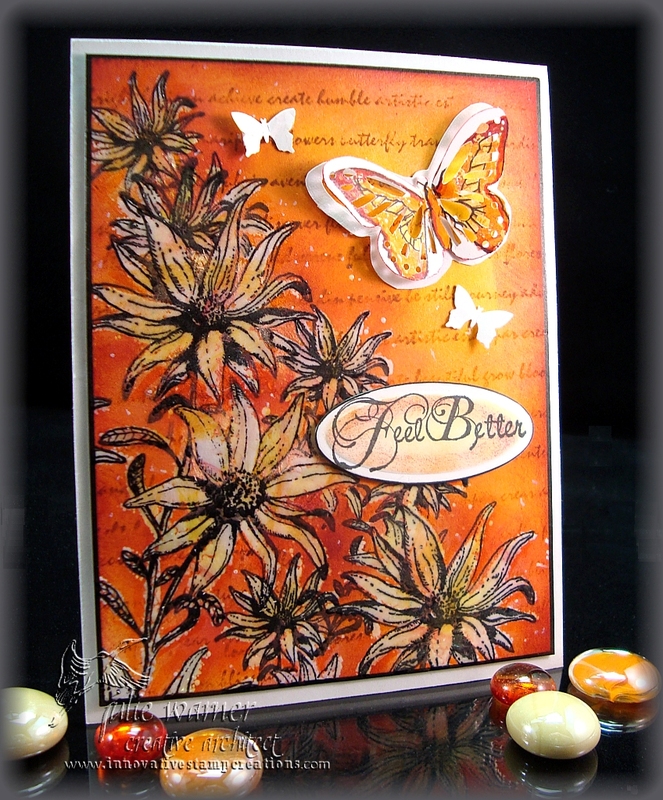 Congrats to Gloria (GloriousGreetings) , the Featured Stamper today at Splitcoast. I picked a couple that I want to case and this is the first one. I chose her Heartfelt Sympathy for this one. I kept the brayered background, silhouette images and big main panel, but I changed the colors, the images and added another layer. All images, embossing powder, adhesives and glitters are from Sparkle N Sprinkle. After doing a brayered bg on a 1/4 sheet of white glossy c/s, I used the static pad and stamped this great Art Deco image in the center of the panel w/ black pigment ink and embossed it w/ black ep. Sometimes I’m asked why I don’t use clear ep w/ the black ink or black ep w/ a clear ink. Almost exclusively, I use an ink very close to the color of the ep I want to use because it gives me a much deeper color. It also hides any flaws like when a tiny portion doesn’t get the ep. I stamped the lady portion of the image again on a scrap of matte white c/s using black permanent ink. On this image, I used markers to color her, cut her out and applied glue and black glitter to her dress. Then I attached her to the base image w/ a little card board under her to give her just a little lift. I used a craft knife to cut the base image along the straight sides because I used the rest of the bg for my big layer. Some highlights were added w/ a white gel pen and lavender and black layers were added underneath before attaching it over the main bg. Another black layer was added then everything was attached to a 4.25 x 5.5 (A2) white card. 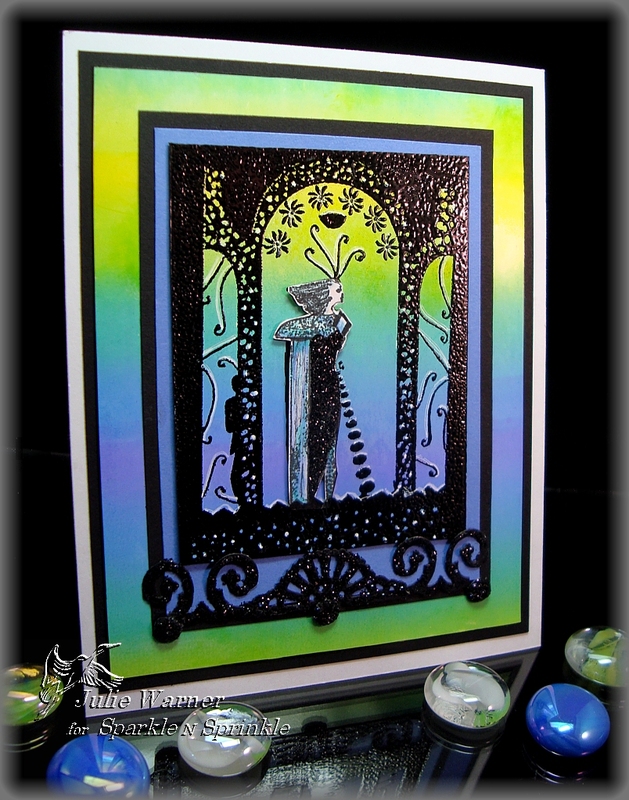 I used a Cuttlebug ornamental border die to cut the black scroll element, brushed glue over it and coated it w/ black glitter before attaching it below the image. I made 3 faux brads and coated them w/ glitter as well. 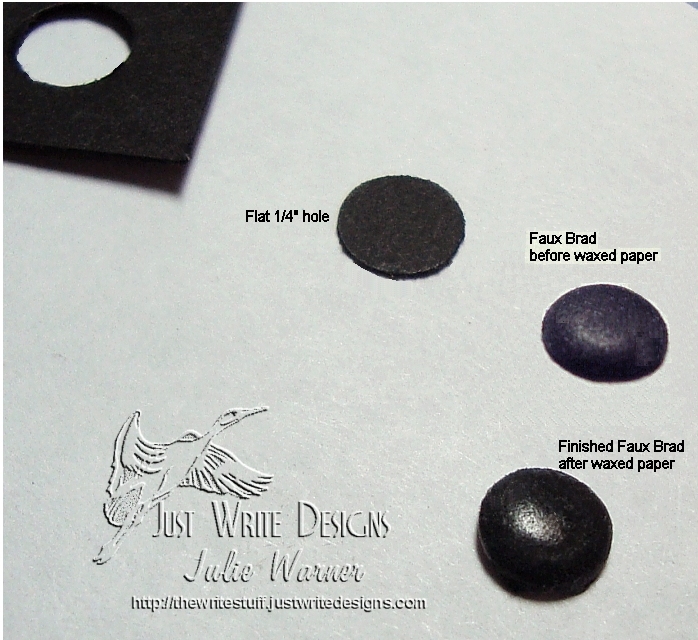 If you’d like to see just how I make these nice rounded brads, I just finished a new Faux Brad Tutorial. I’d love for you to check it out! I frequently make faux brads for my cards. Apart from liking the way they look, I find they go through the mail easier, don’t add a lot of weight and I don’t have the prongs to worry about. I hate it when they stick out or won’t allow the layers to lay flat. They can also be made to match by using the same card stock or designers paper used for the project. Usually I stick to 1/4″ but really, the size is only dependent upon the size of hole or circle punch you use. In my quest to find an easy, consistent way to achieve the distinct rounded shape of a brad, I came up with a little brad jig. I’ve tried a lot of different objects, but this seems to work the best. I made this new one for the tutorial as my old one was made from a cereal box and had a lot of colors and words on it. After I finished this, I went back and added some other sizes using my Japanese screw punch. Step 1: Cut a piece of card board and score where directed. I made my piece a little wider than I need for this, but I added more sizes next to it. 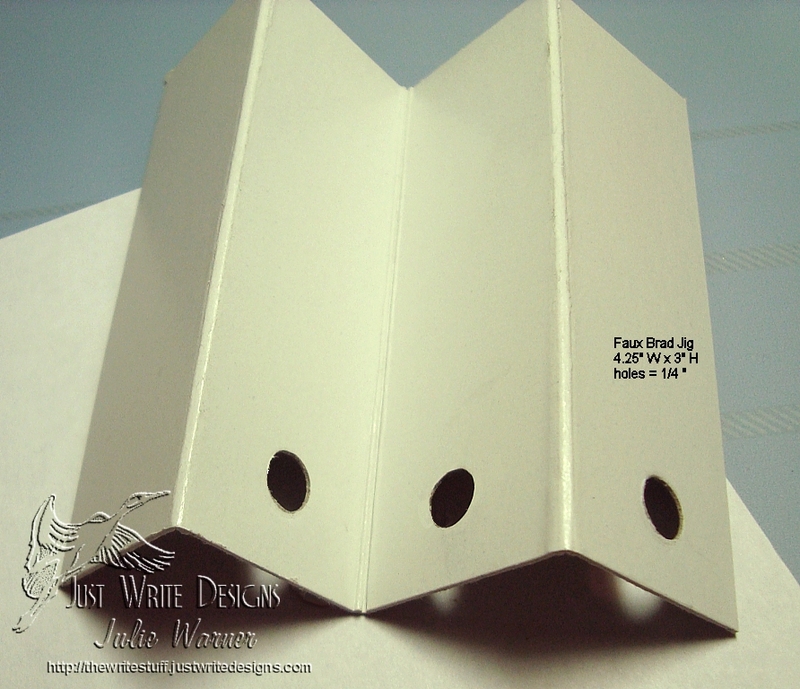 Step 2: Use the punch to create a 1/4″ hole halfway between bottom edge and first fold, as indicated. Steps 3 & 4: Fold the punched layer over the next layer. 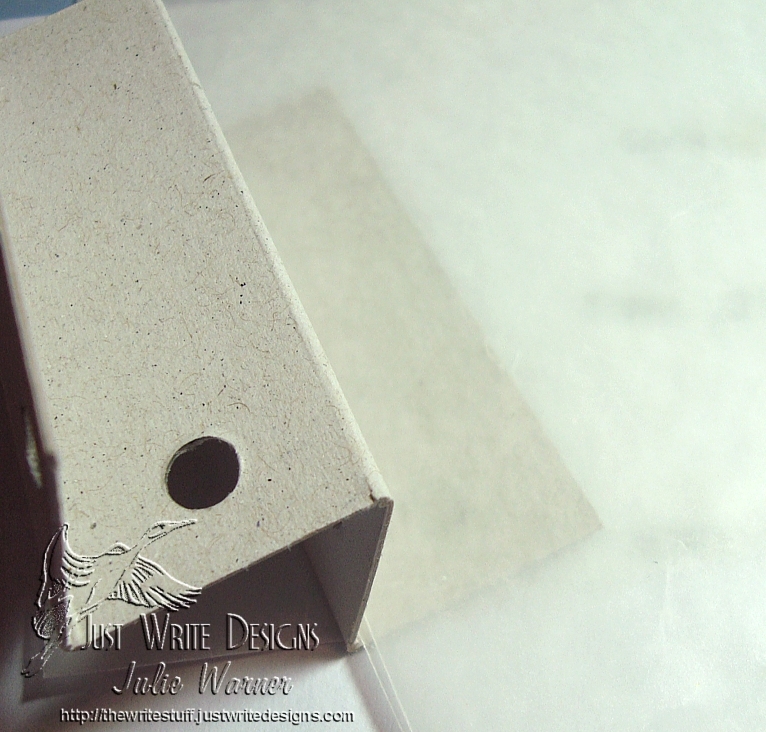 Line up your punch over the punched hole so that you punch through the next layer in the same spot. (Turn your punch over to see the hole.) Repeat this step on the 3rd layer. Leave the 4th layer unpunched. Your Faux Brad Jig should look like the first picture. If you made your jig this size, you will have room to add more sizes, if you wish. First, punch a circle out of card stock. Fold up your jig completely and place the circle inside the hole. I use the largest round end of the silver rolling ball stylus to push the circle into the three layer deep hole. This will slightly round the edges of the circle. You can see in the left photo, the Faux Brad is starting to take shape. Here, I switch to the smaller stylus, but I only use the largest end. I rotate the stylus inside the Faux Brad, concentrating on pushing the edges against the sides for maximum rounding. Make another brad shape out of a scrap of card board. You can use the same hole punch, but I usually use a size smaller to make sure it fits snugly inside the Faux Brad. 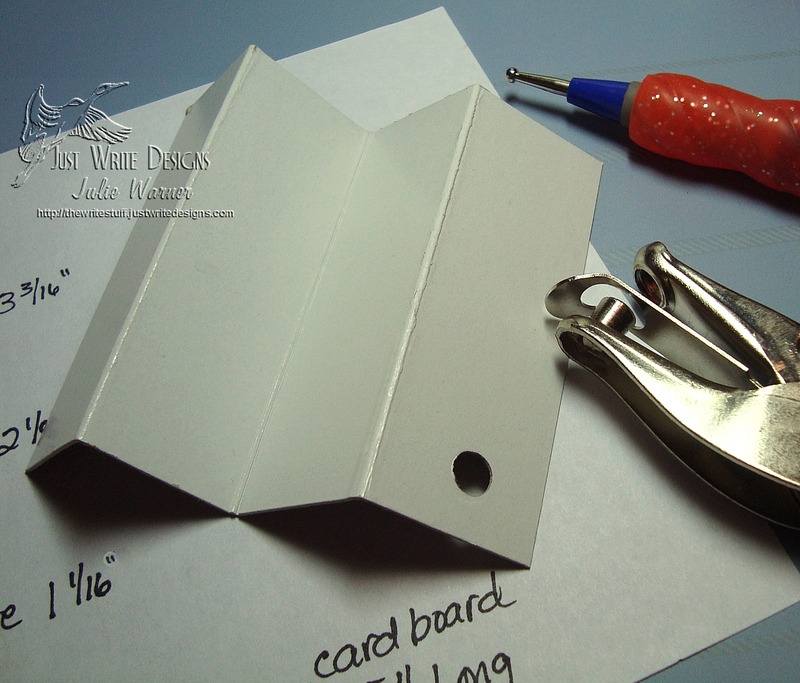 You will need to round the card board circle before using a small amount of glue to attach it inside your Faux Brad. 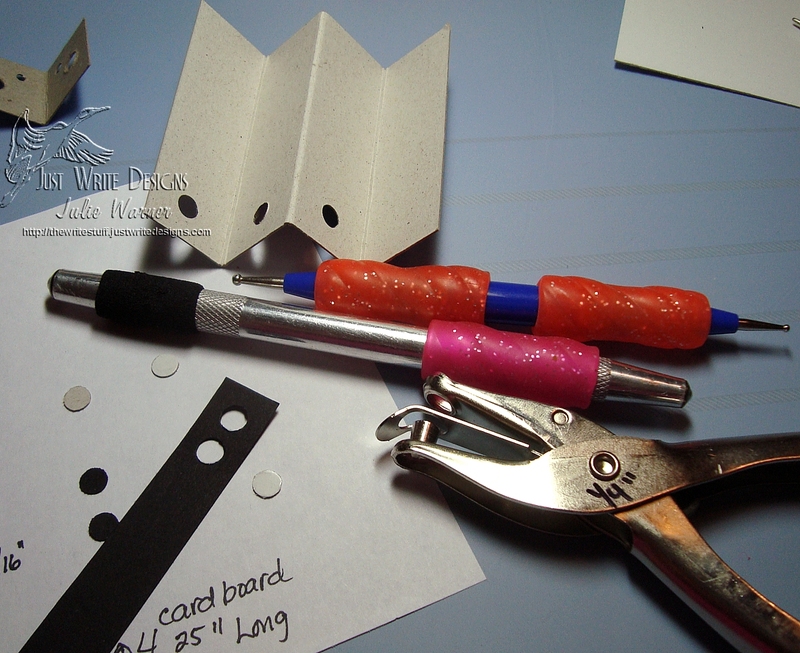 As a finishing touch, I place a piece of wax paper on the last (unpunched) fold of my Jig, place the Faux Brad back into the Jig and use the smaller stylus to ensure that the brad and the card board are firmly glued together. The wax paper keeps any excess glue from sticking to my Jig and it also adds a nice little shine to the brad by “waxing” it. I hope you’ve enjoyed my Faux Brad Tutorial and I hope you’ll give it a try. To see examples of cards using these Faux Brads, click HERE. A list will come up and you can click on any to see the card.